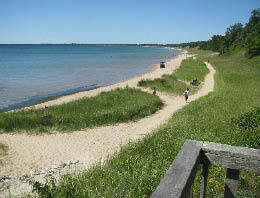 Whitefish Dunes State Park is located on the eastern shore of Door Peninsula, in Sturgeon Bay, Wisconsin. It's set upon 865 acres along the western coast of Lake Michigan. Though sand dunes are not very common in Wisconsin, Whitefish Dunes State Park has the highest sand dune in the state..."Old Baldy," which rises 93 feet above lake level. Visitors are urged to use the wooden boardwalks to reach the top, and to stay on the marked trails while hiking in the dune area. The Red Trail is 2.8 miles through forested dunes. Here is where you can climb stairs up to the top of "Old Baldy." The Green Trail is 1.8 miles in length and is heavily forested. This trail crosses Clark Lake Road where you'll view white pines and hemlock trees. The Yellow Trail is the longest at 4.2 miles over sandy, arid areas. The Black Trail is actually comprised of two loops, the longest one at 2.5 miles. Here you can access Cave Point County Park. The Brachiopod Trail is wheelchair accessible and connects with both the Black and Green trails. It takes you through seven different habitats within the park. The Red Pine Trail is a short .25 mile loop which begins at the fisherman's parking area. Hike through what was once a commercial tree plantation. Park hours are from 6am-8pm daily and the park is open all year. 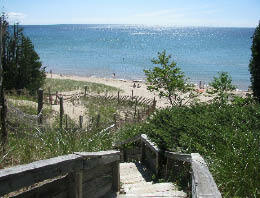 There is no camping at Whitefish Dunes State Park. Pets are welcome. There is also a picnic area with charcoal grills, a shelter and a drinking fountain.